Whether it’s a hot summer day or just a night out with the family, ice cream is a delicious treat that almost everyone enjoys. Ice cream is sweet, delicious, and refreshing on the hottest days. Instead of wasting your money on sweet treats at the ice cream parlor or in the grocery store, why not make your own delicious ice cream right in your very own kitchen? 1.1 What are the different types of Ice Cream Makers? 1.2 What are the advantages of owning an Ice Cream Maker? 1.3 Who are the contenders for Best Ice Cream Maker? Ice cream makers are small kitchen appliances that are used to create frozen ice cream. Some ice cream makers may even make frozen yogurt, sherbet, sorbet, and other frozen goodies. Ice cream makers are easy to use. Simply plug them in, add your ingredients, push a button, and soon, you’ll have your very own homemade ice cream that’s more delicious, creamier, and less expensive than store-bought ice cream. Check out these pointers for more tips on making your own icy treats. What are the different types of Ice Cream Makers? If you’ve never had an ice cream maker before, you might not know what to look for when you begin shopping. There are several different types that you should be aware of so that you can make the best purchasing decision for your household. Gel-canister ice cream makers – These are the most common household ice cream makers. In order to make ice cream, you must first freeze the gel-canister bowl. Once it is frozen, you can add your ingredients to make ice cream, and some models even work for making sorbet, frozen yogurt, and other delicious frozen treats. 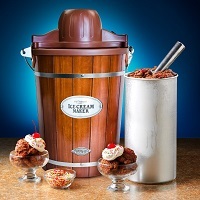 Bucket ice cream makers – These ice cream makers have old-fashioned styling combined with modern touches so making your own ice cream is easy and fun. These ice cream makers use rock salt and ice to freeze your ingredients instead of a gel-canister bowl. Compressor ice cream makers – These ice cream makers use a compressor for cooling, so you don’t have to freeze a bowl or use ice or rock salt. Restaurants and ice cream parlors use compressor ice cream makers because they are the easiest to use and yield the most ice cream in the shortest time. However, the one drawback is that these are typically much more expensive than bucket and gel-canister models. What are the advantages of owning an Ice Cream Maker? One of the best things about owning an ice cream maker is that you can always make your own homemade ice cream right in your kitchen, anytime day or night. It’s also a fun activity that you can do with your entire family. Even the youngest kids can get in on the fun. Another advantage is that you know exactly what’s going into your ice cream. You can use organic, natural products for healthier, tastier ice cream that doesn’t have the preservatives and added ingredients of store-bought products. Who are the contenders for Best Ice Cream Maker? MaxiMatic EIM-506 Elite Gourmet – Bring a little bit of nostalgia to your kitchen with this great ice cream maker. You can make up to six quarts at one time with this budget-friendly small appliance. The hand-crafted pinewood bucket gives this product an old fashion feel, but it also uses modern features like a motor-driven paddle to whip up creamy, delicious ice cream. This model is easy to use, so even kids can get in on the fun. Best of all, it’s priced very affordably. Cuisinart ICE-21 Ice Cream Maker – In just 20 minutes, you can be enjoying your favorite frozen treat when you use this ice cream maker. Not only will you be able to make yummy ice cream, but you can also use this for sorbet, healthy frozen yogurt, and your favorite frozen drinks. Because its fully automatic, all you have to do is add the ingredients and let this machine do all of the hard work. After 20 minutes, your frozen dessert or drink will be ready to consume. After you’ve enjoyed your ice cream, cleaning this maker is a breeze. Cuisinart ICE-100 Compressor Ice Cream and Gelato Maker – Get all of the power of a professional ice cream maker in a smaller package that fits perfectly in any kitchen. This model from Cuisinart, known for its quality kitchen goods, is also a fraction of the price of commercial machines. With this machine, you won’t have to worry about the expense and mess of ice and rock salt. You’ll have perfect homemade ice cream in no time. Extra features like a countdown timer and touch pad controls make for hassle-free operation. Whether you want to make traditional flavors or experiment to create your own frozen desserts, an ice cream maker is exactly what you need for your kitchen. If you think an ice cream maker is something you’d like to try, there are a few things you should consider before making your purchase. Consider each one of these features to ensure you purchase the model that’s right for you. Ice cream makers come with different sized buckets, so you want to purchase the size that best fits your needs. If you have a larger family or you’re making ice cream for a party or special gathering, you’ll want to look for one that makes two or more quarts per session. Consider what you need in order to properly make your own homemade ice cream. Ice cream makers that require rock salt and ice are typically messier, and you always have to make sure you have both items on hand. Gel-canisters don’t require additional ingredients, but they may requires hours of freezing. Machines with compressors are easiest to use and require no extra ingredients, but they are the most expensive. How long does it take until your ice cream maker is finished? If you are in a hurry or have impatient and hungry guests, you will want to select a high-quality machine that works quickly and does not require extra freezing. Make up to six quarts in one batch with this old fashioned-style wooden bucket ice cream maker. You can mix up to 1 ½ quarts of ice cream with every batch in this modern and affordable ice cream maker. The bowl of this stainless steel ice cream and gelato maker holds up to 1 ½ quarts of fresh, homemade goodies. Just add rock salt and ice to the bucket to create your favorite frozen desserts in no time at all. This ice cream maker has a freezer bowl that must be completely frozen prior to use. This eliminates the need for ice when making your ice cream and treats. This model is equipped with a compressor, so no freezing is required. You also don’t have to use messy ice and rock salt. You’ll be enjoying delicious ice cream in just 40 minutes. If the electric mixing doesn’t have the ice cream as firm as you would like it, there is a crank handle that you can use to manually mix the ice cream even more. Your ice cream and frozen treats will be ready to enjoy in 20 minutes or less when you use this machine. You can make frozen drinks, gelato, ice cream, and other treats in 60 minutes or less with this high-end ice cream maker. Go back to a simpler time every time you use this pinewood bucket ice cream maker. The design of this wooden bucket takes you back to a different time, but you still get the convenience of modern features. This ice cream maker is so easy to use, even your kids can get in on the fun. An electric motor powers the motor, doing all of the work for you. All you have to do is whip up your favorite ice cream recipe, add rock salt and ice to the bucket, pour in your ingredients, and start the machine. In just 40 minutes, you’ll be able to enjoy your own homemade ice cream. If your ice cream isn’t firm enough, there’s a manual hand crank you can use to make it extra firm. This ice cream maker gives you great results, it’s inexpensive, and it’s easy to use and clean. One of the more inexpensive makers. It has a high-quality, attractive design. Manual and electric options. It’s easy to use. It’s fun for all ages. It makes up to six quarts of ice cream. All parts remove to make it easy to clean. The wood may crack if not properly cared for. The plastic gears may wear down over time. This maker requires rock salt, which is an extra expense. The hand crank does not work well when used alone. It is best for firming ice cream made using the electric motor. Are you craving ice cream? You can have it in 20 minutes or less when you use this ice cream maker. If you’re not in the mood for ice cream, make your own frozen yogurt, sorbet, or frozen drinks in just a few minutes. All you have to do is make sure the freezing bowl is completely frozen, turn it on, add your favorite ingredients, and you’re ready to consume your homemade goodies in just minutes. The freezing bowl has double walls for even freezing. The easy lock lid helps you avoid messes, and the large spout makes it simple to add your favorite ingredients. When you’re finished using the ice cream maker, it disassembles for easy cleaning, and the cord conveniently retracts while it’s not in use. It is affordable. It does not require the added expense of rock salt. The wide spout makes it easy to pour. Once prepped, ice cream is ready in 20 minutes or less. The nonslip feet keep it stable during use. It has a retractable cord. It creates ice cream, sorbet, frozen yogurt, frozen drinks, and more. Easy to use. It is easy to clean. The mixing paddle feels very flimsy. Freezer bowl must be frozen for 16 to 24 hours before use. If you don’t want to wait hours for your ice cream bowl to freeze, and you hate the mess and hassle caused by rock salt and ice, you’ll want to purchase an ice cream maker that is equipped with a compressor that is strong enough to do all of the hard work. This model from Cuisinart is durable enough to handle any frozen dessert, has a modern stainless steel design, and it performs better than many household ice cream machines. Two mixing paddles are included to create to create smooth, creamy ice cream or light and airy gelato. The transparent lid is easy to remove but stays put during the churning process. The spout allows you to toss in your favorite ingredients during the freezing process. You can make up to 1 ½ quarts per batch with this machine. Your frozen treat will be churned and mixed to perfection every time with the easy to use touch pad and built-in timer. If you can’t get to your ice cream in time, don’t worry. This ice cream maker is equipped with a 10-minute Keep Cool feature that prevents your batch from melting until you can remove it and store it in your freezer. It is very easy to use. It cools using a compressor and does not require any other ingredients. Easily makes multiple batches in a row. It comes with two different mixing paddles for ice cream or gelato. Also makes frozen drinks and frozen yogurt. The finish looks clean and modern. It has a built-in timer and LCD screen. It’s larger than other home ice cream makers. It is more expensive than many other models. It may be a bit noisy. Nothing beats homemade ice cream after a day out in the sun, a birthday party or special gathering, or just a night in with the family. Instead of buying processed ice cream that contains preservatives and flavorings that you can’t even identify, use an ice cream machine to make your own personalized frozen desserts right in your own kitchen. If you want an ice cream machine that does all of the work for you and doesn’t require waiting on bowls to freeze or adding extra ingredients, the Cuisinart ICE-100 is an excellent choice. You’ll have a great time making your own ice cream with your loved ones, and you’ll especially love enjoying the tasty results in just one hour or less.